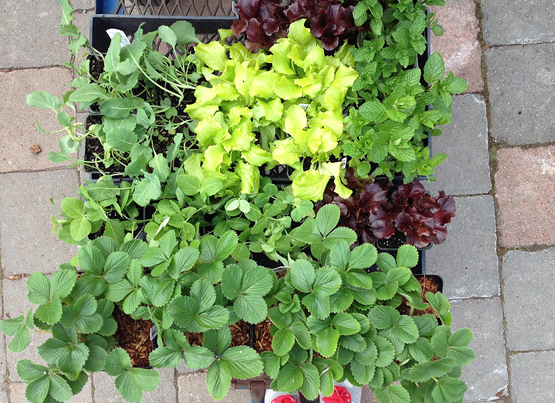 We’re longtime landscapers and first-time veggie gardeners. Vegetable gardening is an undertaking that many want to try, but don’t know how to begin and become intimidated by the thought of it. Sure, we could have waited to start until we constructed raised beds for our garden, like we did here for our clients, but we didn’t. We found an open plot of land on our 1-acre lot, roughly 15-feet by 25-feet, brought in about 8 yards of Vern’s Organic Soil, spread it, graded it, and simply planted our organic veggie starts in the ground. We said to ourselves: let’s just do it, hoping that our vegetable garden would feel like play instead of work. We’ve probably made mistakes, but what better way to learn? We’ll pay close attention to our successes and failures, and next year’s yield will be even more bountiful. 1. Organic veggie gardening from starts is not cheap. We knew that it would be an investment in our health and well-being, and that the nutritional value of produce eaten from one’s own garden is much higher than store-bought produce. Next year, we may experiment with seeds. But this year is all about building confidence! Once we established a favorable subgrade, we spread organic Garden Mix soil from Vern’s. Soil is so important to the success of any garden, edible or ornamental. To us, paying the extra cost upfront for organic soil is worth every penny. We may be newbies, but our instinct tells us that we’ll reap the return on investment when it’s time to harvest. We purchased broccoli, kale, and mixed greens from the Food Coop in Port Townsend, along with Seattle Tilth’s helpful garden guide for $17. 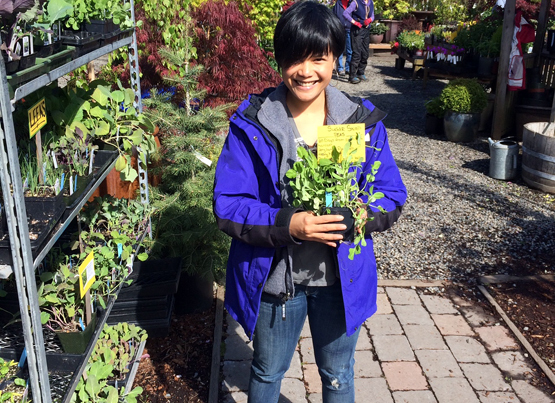 The following Saturday, we headed to Bainbridge Island’s Bay Hay and Feed to purchase red leaf lettuce, peas, mint, strawberries and blueberries. Roughly $200 was spent on our organic starts and berry plants. Side note: blueberries will produce better fruit if different varieties are planted for cross-pollination. Sluggo is another necessary investment and can be found at any gardening supply store. We were a little late in applying this at the perimeter of our garden, and four of our starts were eaten up by slugs in a matter of a few days. We purchased Dr. Earth’s Life, an all-purpose organic fertilizer that is the esteemed brand’s easiest fertilizer to use because it doesn’t have to be worked into the soil once applied. We thought the organic soil would offer enough nutrients for our plants, but an extremely helpful employee at Bay Hay and Feed corrected us in our thinking. She’s been gardening since she was three, so we took her advice. Our vining peas need support to grow, so we purchased a metal structure to direct growth. Fingers crossed that we got the right size. 2. Maybe – just maybe – we planted our starts too closely together. A friendly gardener who checked us out at the Food Coop informed us that our broccoli starts should be spaced at least 16-inches apart. We may have been a little too relaxed when it came to planting, as the space between some of our broccoli looks like 14-inches at best. Perhaps we didn’t plan our plot well enough. Because if we were to start again, knowing what we know now, we would have planted our vining peas at the back instead of in the middle. If the damage is purely aesthetic, we can live with that. 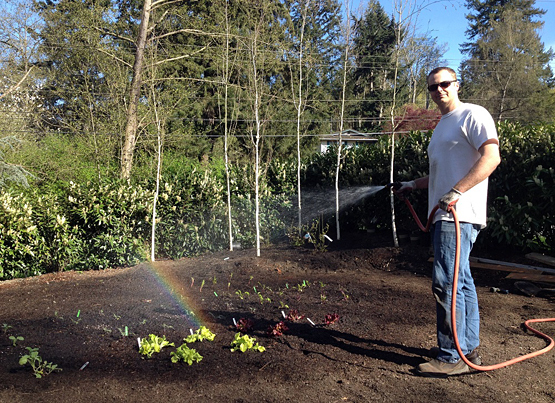 Colby watered our vegetable garden and made a rainbow! 3. 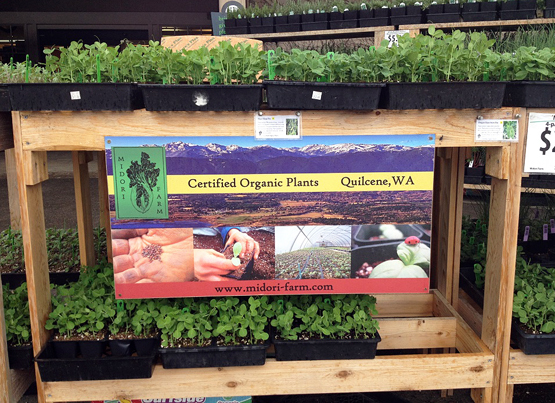 Certified organic starts are not readily available at all nurseries and garden supply stores in Kitsap County. We know this because we called around. Bay Hay and Feed has proved to be our go-to for organic starts in Kitsap. Jefferson County, however, is a whole different story. We plan to take a trip to Midori Farm in Quilcene sometime this season. 4. As with all good things, we must exercise patience. Of course, patience is required before harvest, but patience is also required to plant some of your favorite veggies. We made another trip out to Bay Hay and Feed over the weekend thinking that cucumbers would be ready for purchase. After all, The Old Farmer’s Almanac says April’s the time for cucumbers to be planted. When we got there, we were told we’d have to wait until Mother’s Day weekend. Yes, cucumbers can be found for purchase now at other retail outlets, but the experienced gardeners there want their patrons to succeed. They’ve deemed the weather too cold for absolute cucumber success. 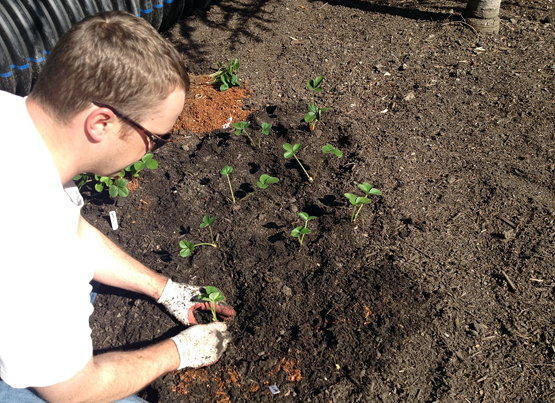 So, as hard as it is to leave space open in our garden, bare and unplanted, we’ll wait another few weeks for cucumbers. We love Bainbridge Island’s Bay Hay & Feed. That’s the extent of what we’ve learned so far from our first vegetable garden. To any experienced and non-experienced veggie gardeners reading this, feel free to log into Facebook and leave a comment below, telling us what’s worked for you. We’d love to hear from you!